The sun is setting on Myst Island. It dips towards the ocean, which stretches boundless in every direction. From where I stand, the last pale orange rays stretch across the sky, scrabbling for purchase between a few thinning trees. The clock tower, the electrical station, the library, the rocket—all are silhouetted against the day's final minutes. And then the stars come out. We have the technology. We can rebuild it. 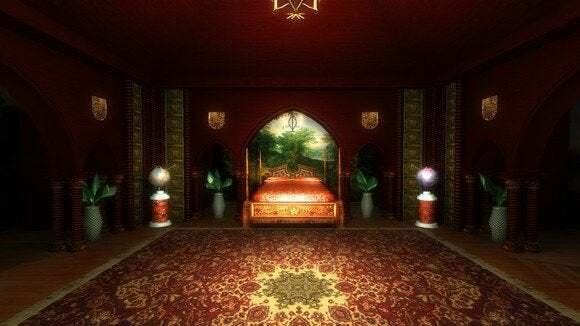 Like so many other people, Myst was the first "real" game I played, despite being a kid and understanding nothing about the game. In fact, I don't even know if I ever got off Myst Island and made it to the other ages at the time. Regardless, I wandered Myst Island for hours, delved into the library's secrets, flipped the marker switches up and down, heard the desperate pleas of Sirrus and Achenar. 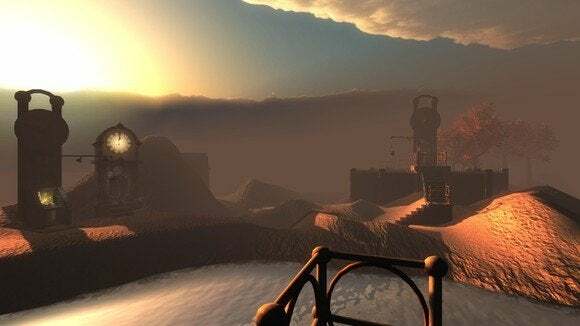 Twenty years on— that's right—as of next year, you can take that first edition copy of Myst out to your favorite bar and buy it a drink—Myst still holds a dear place in my heart. To celebrate this auspicious anniversary, Cyan has released realMyst: Masterpiece Edition. This is the fourth major version of Myst—the original, realMyst, Myst: Masterpiece Edition, and now realMyst: Masterpiece Edition. The original Myst was made in Hypercard and was essentially an interactive slideshow: A collection of hand-drawn environments you navigated by clicking. RealMyst, on the other hand, turned those 2D environments into fully-realized, 3D polygonal spaces. The "Masterpiece Edition" designation is basically Cyan's way of saying "Director's Cut" or "Remastered." 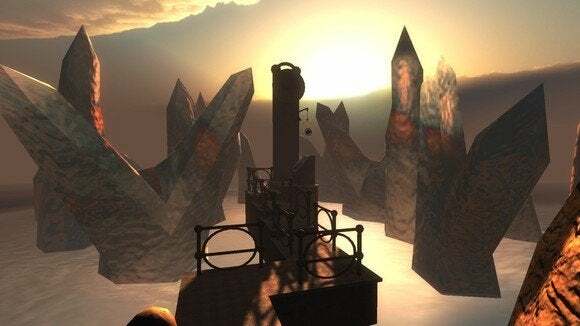 So, in other words, realMyst: Masterpiece Edition is a visually-enhanced version of realMyst, which was already a fork of the original Myst line but rendered in polygons. Got that? Phew. You'd never know realMyst: Masterpiece Edition is essentially a twenty-year-old game. This isn't Battlefield 4, by any means, but the new Unity Engine-ified version of Myst Island looks comparatively gorgeous here. The addition of a day-night cycle is utterly pointless, but exploring at night or even at sunset adds a certain solemnity to the isolated loneliness of the island. Aside from a few muddy textures (especially the ones used inside the library's destroyed books), this is Myst Island and the Ages as you've never seen them before. It's a fantastic looking overhaul. The most confusing part, actually, is that you have these amazing graphics on a game that conceptually feels so '90s. Whereas Myst's sequel, Riven, went with a more naturalistic environment, Myst is a unicorn taped to the hood of a car. It's red smacked right up against green. What I mean is Myst's fantastical hub world, Myst Island, smashes together elements from four or five very different design schools, and this clashing juxtaposition of the various ages both makes Myst Island visually fascinating and makes it a relic of a type of '90s hodge-podge design that's largely disappeared—and that no amount of high-res textures can cover up. Nowadays games, especially puzzle games, value a coherency or cohesiveness to the environmental designs that just isn't present in Myst. But really that's neither here nor there. Myst Island is Myst Island, and I still love it even if the design is insane. What I don't love is the amount of frame-dropping in realMyst: Masterpiece Edition. There's no way of getting around it— realMyst: Masterpiece Edition is poorly optimized. Despite multiple patches since release, the game still slows down for inexplicable reasons. Even with graphics settings dialed down I experienced stuttering. The game looks good, but not that good, and certainly not good enough I should've had trouble getting it to run, even at the highest graphics settings. 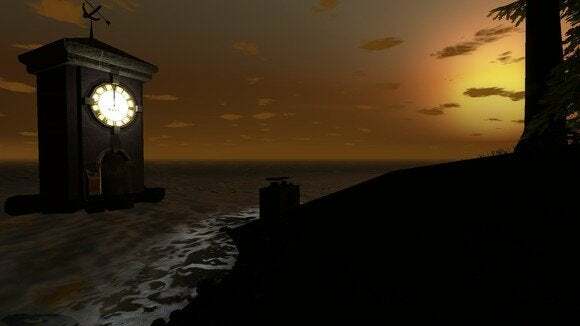 RealMyst: Masterpiece Edition also has two control schemes: A "Classic" mode that controls like the point-and-click games of yesteryear, and a free-roam mode that allows you to walk and look around at will. With Classic controls, Cyan went back in and mapped the original camera angles from 2D Myst onto the 3D environments, so you're basically playingMyst as it was originally intended, except instead of warping to the next camera angle, your character walks over. It's a bit disorienting if you did play original Myst, because walking over takes up more time (though there's a bar to adjust walk speed). Free-roam mode is a mess, however. When you're walking, the game controls like a standard first-person game—that is to say, when you move the mouse your view also changes. This is how first-person games have played since time immemorial. But when you stop moving in realMyst: Masterpiece Edition, your controls change. Now you have to hold down right click to pan around, or scroll with the edges of the screen. It's an awkward and convoluted means of control, and I found myself more often than not moving rapidly back and forth so I could trick the game into giving me standard mouse-look controls instead of dealing with the Right-Click-to-pan scheme. As far as how difficult Myst actually is these days—well, I honestly can't tell you. I didn't feel like I remembered much of the game's solutions going in. Nevertheless, I beat it in four hours. Whether that's a commentary on the game being simpler in a post-Riven, post-adulthood, or post-"I've played a ton of games and recognize some of the tropes" world...I just can't say. RealMyst: Masterpiece Edition is beautiful, and I still love Myst, but I don't know if this is "the definitive version" of the game. 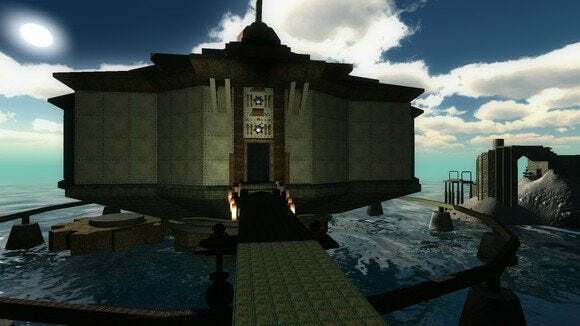 Certainly it's the easiest to run on modern hardware, but I still would probably opt for Myst: Masterpiece Edition if only because it's better optimized and, well, costs a lot less. If you want something that "just runs," though, or you're determined to freely wander Myst Island, this updated realMyst is your best bet. And hey, it's quite a sight to see the sun set. Meet the new RealMyst, a lot like the old Myst - but with vastly improved graphics.